Ömerli Reservoir, Paşaköy Stream, PCA, CCA, zooplankton, organic pollution, eutrophication. Water quality in an aquatic ecosystem is determined by many physical, chemical and biological factors. Streams, rivers, lakes, and inland wetlands are interactive components of watersheds, and physical and chemical conditions of these ecosystems reflect the land use patterns and physical characteristics of the landscapes. Land use is one of the most essential factors determining water quality (Allan and Flecker, 1993). As land use patterns change and human populations increase, impacts of urbanization along the wild land-urban interface on water quality and aquatic resources will be accelerated (Mulholland and Hill, 1997; Tufford et al., 2003). A water reservoir usually changes its trophic status gradually to a higher level, even under natural conditions. However, human activities accelerate eutrophication process reservoir over the years. As a result of the rapid progress in human activity, the increasing population of the catchments area or excess fertilization of farmland increases the nutrient loading to lakes via connected streams and rivers (Goldman, 1988). This high input of nutrients by the flowing waters may lead to deterioration of water quality in lakes and reservoirs. As many other Mediterranean countries, in Turkey unplanned industrialization and distorted structuring have brought some lake eutrophicaeutrophication and augmentation of phytoplankton standing crops (Albay et al., 2003, Karafistan and Arık-Çolakoğlu, 2005). A blooming of cyanobacteria is a typical phenomenon caused by eutrophication. In Ömerli Reservoir which is the biggest water reservoir supplying 48% drinking water of Istanbul, this event has occurred frequently since the 1990s (Albay et al., 2003), and there has been serious concern about eutrophication and cyanobacteria blooms ever since. Although this fact is known for a long time, there is no detailed study available on the streams which are possibly responsible in increase eutrophication by carrying nutrients into Ömerli reservoir. Therefore, the main aim of the study was to assess effects of the streams on Ömerli Reservoir which investigating specifically physical, chemical and biological parameters in both lake and its flowing streams. The Ömerli Reservoir was established in 1972 to provide drinkable water for Istanbul. The Riva Stream was located between the reservoir and Black Sea as discharge water for the reservoir. 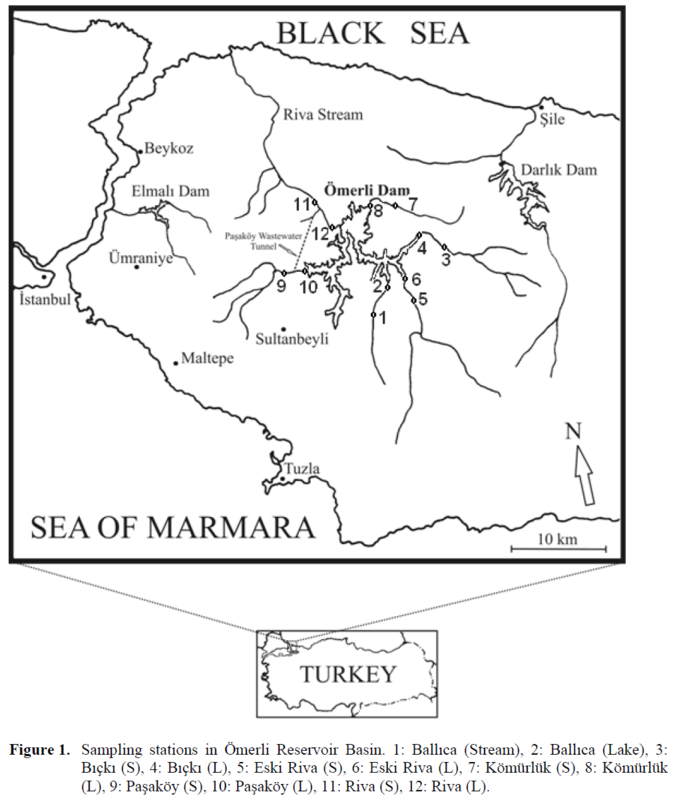 The reservoir currently is the biggest drinkable water reservoir in the northern part of the Marmara region of Turkey (area=23.5 km2; maximum depth = 62 m; volume = 2.2 x 106 m3; Latitude 41°:02′ N, Longitude 29°:22′ E). Although the reservoir provides ≈ 48% (mean = 872000 m3 per day) potable water to Istanbul, the reservoir has been suffering from increasing eutrophication over the last few decades due to input of domestic and industrial waste water, which enter mainly via streams (Albay et al., 2003). There are many small seasonal streams which are feeding the reservoir. One of the most important streams is Paşaköy that was connected to the Riva Stream via a tunnel (3 m diameter and 6 km length) in order to prevent domestic and industrial wastewater inputs into the reservoir (Figure 1). In the late 1990s the reservoir began to suffer from the toxic cyanobacterial (blue-green algae) blooms during late summer and mid autumn. In subsequent years, several thousand of fish (mainly Cyprinus carpio L., 1758) died from high cyanotoxin (microcystin) levels (Albay et al., 2003). In recent years, Istanbul Water Authority has applied copper sulphate (algicide) to control the blue-green algal biomass at specific sites in the reservoir. Figure 1. Sampling stations in Ömerli Reservoir Basin. 1: Ballıca (Stream), 2: Ballıca (Lake), 3: Bıçkı (S), 4: Bıçkı (L), 5: Eski Riva (S), 6: Eski Riva (L), 7: Kömürlük (S), 8: Kömürlük (L), 9: Paşaköy (S), 10: Paşaköy (L), 11: Riva (S), 12: Riva (L). Five inflows and one outflow streams were selected for sampling as they were usually not dried up (i.e. available for sampling in all seasons). Samples for chemical analyses were taken from the streams and their mouth to the lake between June 2005 and July 2006 on monthly basis. Water samples for nutrient analysis (NO3-N, NO2-N, TP, o-PO4, SiO2, SO4) were kept cool and in the dark until they were brought to the laboratory and then analyzed according to the standard methods (APHA, 1985). Temperature, dissolved oxygen, conductivity, and pH were measured in situ using a multi-parameter probe (Radiometer, Pioneer 65). Light intensity (lx) was measured to the nearest 1 lx using a Lutron LX 103 digital light meter. For suspended solid material (SSM), 100 ml water was taken for each sampling stations and it was dried by exposing 105°C for 12 hours, then the remained material was weighed. Water samples for Chlorophyll-a content was filtered and extracted through ethanol. Following the centrifugation, absorbance was measured before and after acidification in a spectrophotometer and then calculated (Ryther and Yentsch, 1957). Zooplankton samples were collected with the plankton net (cell diameter of 55 μm) and fixed in 4% formalin solution and examined under an inverted microscope. The sampling was not possible due to drying up of some streams in summer months or their insufficient water density throughout the year (i.e. Paşaköy Stream). References used for the identification of zooplankton taxa were obtained from Mozdukhay (1969), Rose and Tregouboff (1957), Pontin (1978). Species diversity was expressed with Shannon- Weaver Index (Shannon and Wiener, 1949). ni – biomass of (i)-species. Principal components analysis (PCA) was employed to evaluate biotic (taxa) and abiotic (physical or chemical) variables following ter Braak and Prentice (1988) using CANOCO v. 4.5 (ter Braak and Smilauer, 2002). PCA was run on a correlation matrix of centered, standardized and transformed variables using correlation biplot scaling of PCA axes. 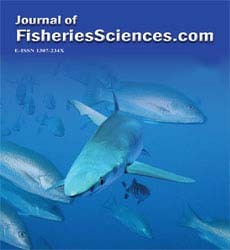 Linear and nonlinear Canonical Correspondence Analyses (CCAs) (ter Braak, 1994; Legendre and Legendre, 1998; Makarenkov and Legendre, 2002) were used to explore relationship between the annual maximum abundances of zooplankton and environmental variables. All data were log transformed prior to analysis to better approximate normal distributions. A Monte Carlo permutation test (with 499 permutations) with forward selection was used to obtain significance values (α = 0.05) for each variable. The mean values of each environmental factors and zooplankton data were analyzed using program CANOCO v. 4.5 (ter Braak and Smilauer, 2002). Differences between sampling stations were tested with Analysis of Variance (ANOVA) (Zar, 1999) and Pearson Product Moment Correlation Analysis was used to explore correlations among biotic and abiotic factors using program STATISTICA 5.0 (StaSoft Inc. 1995). Physical features which are temperature, conductivity, TDS, stream width and flow were not significantly different between streams and sampling stations in the lake (ANOVA, P>0.05). However, TP and NO2 as the most important nutrients and SSM were significantly higher (P<0.01) in Paşaköy and Riva streams compared to other streams. Other chemical variables were not so high and did not change between seasons and sampling points (P>0.05). Mainly, TP, o- PO4, and NO2 concentrations in the stream sites were higher than those in their lake sites. This effect was the most distinguished in Paşaköy Stream. Chl-a concentrations showed seasonal variations having minimum values in winter and maximum ones in the summer months. Reservoir sites had higher Chl-concentrations compared to streams sites. Paşaköy, Riva and Eski Riva streams were represented by the highest Chl-a values. The first (PCA1) and second (PCA2) axis were both significant and explained 35.8% and 28.5% of observed variance in environmental variables, respectively (Figure 2). Chl-a exhibited high positive loadings on PCA1, while stream width and flow were negatively correlated with this axis. 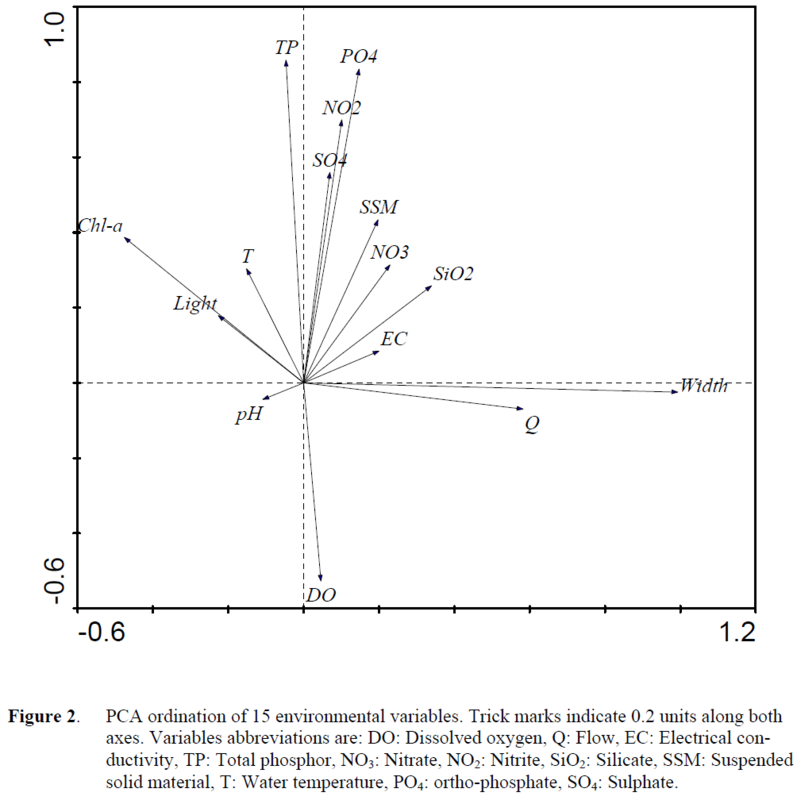 TP, o-PO4 and NO2 were positively correlated while dissolved oxygen negatively with PCA2. Figure 2. PCA ordination of 15 environmental variables. Trick marks indicate 0.2 units along both axes. Variables abbreviations are: DO: Dissolved oxygen, Q: Flow, EC: Electrical conductivity, TP: Total phosphor, NO3: Nitrate, NO2: Nitrite, SiO2: Silicate, SSM: Suspended solid material, T: Water temperature, PO4: ortho-phosphate, SO4: Sulphate. The zooplankton community was composed of crustaceans (cyclopoid copepods, nauplii, Cyclops sp., Bosmina longirostis, Daphnia sp., Diaphanosoma sp.) and 17 species of Rotifera (Table 1). Rotifera was the dominant group with 90.6%. 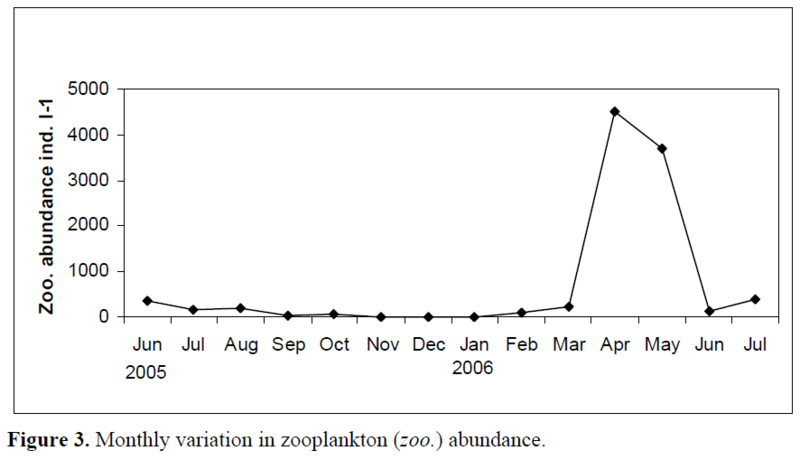 The succession of zooplankton showed maximum in April (Figure 3) with a value of 4504 ind. l-1. Rotifers were present throughout the sampling period. During the sampling period, two Rotifer species, Keratella cochlearis and Polyarthra sp. were present. Cladocers and Copepods appeared in only few densities. The lake sites had always higher diversity index and streams were represented by few zooplankton species and abundances with exception of Paşaköy and Riva streams (Table 2). Indeed, the general complexity and overall similarity of the zooplankton community in the Ömerli Reservoir system was reflected in the results of the PCA that showed the first two factors captured about 66.7% of the variability in the dataset. PCA1 (Figure 4) accounted for about 49.6% of the primarily reflected differences in the abundance of Keratella cochlearis (negative) and Polyarthra sp. and Filinia sp. (both positive). Table 1. 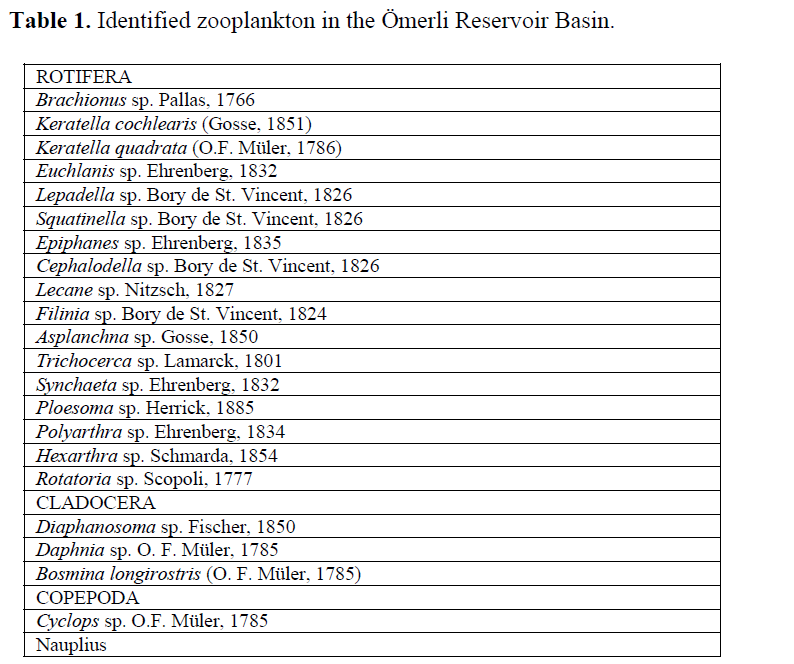 Identified zooplankton in the Ömerli Reservoir Basin. Figure 3. Monthly variation in zooplankton (zoo.) abundance. Figure 4. PCA ordination of 25 zooplankton species. Trick marks indicate 0.2 units along both axes. Species abbreviations are: Bra: Brachionus sp, Kcoc: Keratella cochlearis, Kqua: Keratella quadrata, Euc: Euchlanis sp., Lep: Lepadella sp., Squ: Squatinella sp., Epi: Epiphanes sp., Cep: Cephalodella sp., Lec: Lecane sp., Fil: Filinia sp., Asp: Asplanchna sp., Tri: Trichocerca sp., Syn: Synchaeta sp., Plo: Ploesoma sp., Pol: Polyarthra sp., Hex: Hexarthra sp., Rot: Rototoria sp., Dia: Diaphanosoma sp., Dap: Daphnia sp. Bos: Bosmina longirostris., Cyc: Cyclops sp. Nau: Nauplius. The first two CCA axes (Axis 1 with λ = 0.181 and Axis 2 with λ = 0.112) explained 48.6% of the variance in the species abundance data (Table 3). Arrows represent environmental data (Figure 5) and point the factor direction of maximum variation. The length of each arrow is proportional to importance of that variable in assemblage ordination. 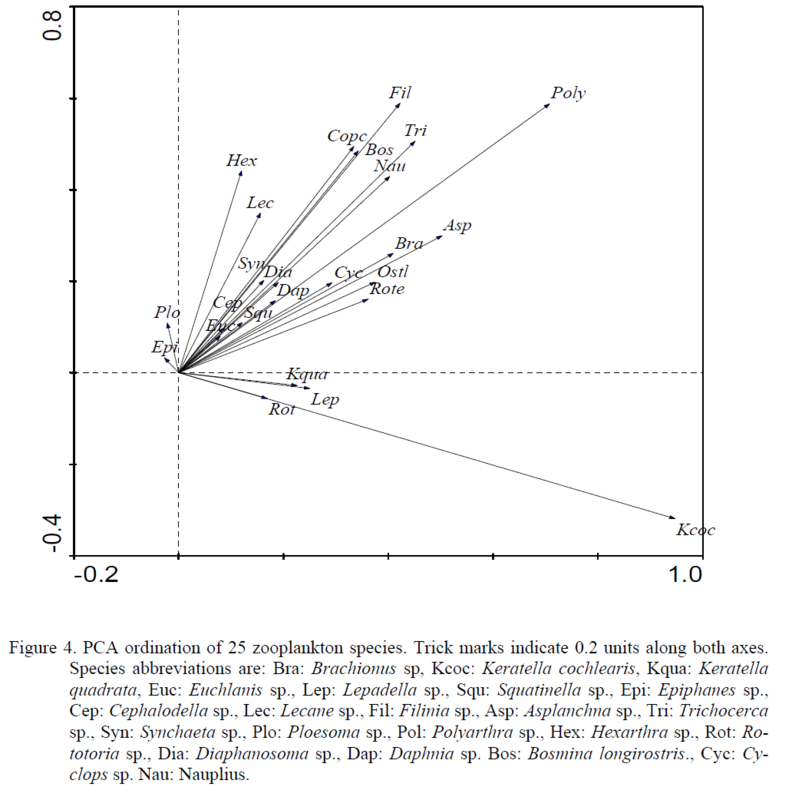 Accordingly, NO3, NO2, TP, o-PO4, Chl-a, pH, SSM, temperature, oxygen, light and stream width were the most significant (P<0.01) variables with respect to species occurrence of zooplankton. The remaining variables had a relatively small effect on the species composition. The species-environment correlations were high as 0.780 for the first axis and 0.631 for the second axis. Figure 5. Canocial correspondence analysis diagram of species and environmental variables. Arrows indicate environmental variables. See Fig. 2 and 4 for species and variables abbreviations. Table 3. Main results of canonical correspondence analysis (CCA). The results showed that all the studied chemical and physical parameters during 14 months had profound effect on the streams and consequently the lake. PCA analysis indicated that physical parameters were the most important factors while chemical factors were the second important variables which affected the streams. In fact, CCA analysis suggested that these chemical and physical variables correlated well with the zooplankton communities. The results also indicated that physical features such as temperature, conductivity, TDS, flow, stream width were complying with the typical seasonal changes of Mediterranean type of streams as expected (Butturini et al., 2002; Cobelas et al., 2005). These types of streams were characterized by slow flow, high temperature, TDS, conductivity in summer while vice versa in winter months. Basically, changes in these variables are due to mostly temperature fluctuations. Higher conductivity and TDS values in the streams can be explained by either direct effect of temperature or some particles transported by sediments in the streams. pH values obtained in the present study were in agreement with the previous studies conducted in the Ömerli Reservoir (Albay and Akçaalan, 2003; Gürevin et al., 2006). However, SSM, TP and o-PO4 concentrations were represented as mostly higher in the streams than the lake which suggests potential effect of streams to the lake by transporting solid particles and nutrients. Considerably higher nutrient values were also observed in Paşaköy and Riva streams. Fluctuations in the nutrient concentrations in the streams during the study period are suggestive of potential affect of anthropogenic activities. Ceyhan (1999) determined that SSM in the Paşaköy Stream increased from 14.7 mg l-1 to 56 mg l-1 in a seven years period (1990- 1997). In the present study, the average SSM of the same stream had almost nine times more than those measured in 1997 by Ceyhan (1999). Similarly, Ceyhan (1999) also highlighted dramatic increase of TP in Paşaköy Stream from 560 μg l-1 in 1990 to 2900 μg l-1 in 1998. However, in the present study TP was found 1460 μg l-1 in Paşaköy Stream while it was 628 μg l-1 in its mouth opening to the lake. Recent residential development near Ömerli Reservoir has mostly influenced Paşaköy Stream which has received much sewage water from thousands of people and industrial development. In 1998, a Biological Plant Treatment was constructed on Paşaköy Stream to decrease nutrients levels of the stream and then this stream was connected to Riva Stream to prevent domestic and industrial wastewater inputs into the reservoir. However, findings of the present study suggest that no significant improvement of water quality has been achieved compared to previous studies (Ceyhan, 1999; Albay and Akcaalan, 2003; Gürevin 2004) for both in the stream and the lake. It was also observed that water from the Treatment Plant still emptied into the reservoir when flow of Paşaköy Stream was high. In fact, water quality of Riva Stream has become much worse after connection of the Paşaköy Stream. Determining empirical relationships between anthropogenic stressors and water chemistry is an important step toward understanding and accounting for the factors that control water quality in the streams. Research so far has demonstrated that watershed land use influence the physical– chemical conditions of receiving waters. Numerous studies have attributed nutrient enrichment in streams to the export of nutrients have been linked to nutrient levels in lotic ecosystems (Dillon and Kirchner, 1975; Johnson et al., 1997). The results suggest that Ömerli Reservoir water quality is strongly and positively related to point source discharges, activities related to urban and residential development. A linkage between stream water chemistry and increase in human population is consistent with the findings of Carpenter et al. (1998), who reported strong relationships between sewage discharge and an integrated index of nutrient enrichment. Jordan et al. (1997) observed that TP was the most strongly associated with suspended particles in streams of the Chesapeake Bay watershed and concluded that a large pool of phosphorus was adsorbed and transported with sediment. TP was highly correlated with SSM in the sites sampled in the present study and it is likely that phosphorus concentrations are influenced by factors controlling erosion and sediment transport. TP was also strongly correlated with Chl-a concentrations, suggesting that phytoplankton is another important pool of phosphorus in the streams. Urban land use and point source discharges have been linked to phosphorus enrichment in stream ecosystems (Osborne and Wiley, 1988). It is well known that high flow stored nutrients which are flushed out to be taken up or stored in locations farther downstream (Clinton and Vose, 2006). In contrast, prolonged periods of in-stream water retention increase a variety of in-stream bio-chemical processes (Baker et al., 2000) as is the case with streams in the present study which has very slow flow regime as they are not so sharp and steep. Zooplankton composition of the streams and lake studied has supported the nutrient-enriched status of Paşaköy and Riva streams by dominancy of some indicator species of eutrophicated waters, i.e. Bosmina longirostris, Keratella cochlearis, Polyarthra sp., Filinia sp. (Herzig, 1987; Berzins and Pejler, 1987; Berzins and Bertilsson, 1989). In fact, statistical analyses have revealed that strong relationships of these species to NO2, NO3, TP, o-PO4, CHL-a are also indication of eutrophication. Considering previous studies and present results, it seems that there is a trend for crustacean zooplankton biomass to strongly with TP (Hanson and Peters 1984; Pace, 1984; Yan, 1986) and less with Chl-a. A possible explanation could be the higher seasonal variability found for Chl-a when compared with TP (Hanson and Peters, 1984). In conclusion, this study suggests that streams are heavily affected by urbanization or other land uses and have negatively influenced the Ömerli Reservoir, which is very important for supplying drinkable water of Istanbul metropolitan. The polluted streams should be rehabilitated and managed more effectively. Undisturbed streams access must retain its clarity and low nutrient content. Water quality and other limnological variables should be continuously monitored on regular basis. The author thanks Meriç Albay, Özcan Gaygusuz, Cenk Gürevin, Zeynep Dorak, Nadi Gökalp and several post graduate students who help in field sampling and laboratory analyses. The authors also thank Nurhayat Dalkıran and Didem Karacaoğlu for helping with statistical analysis and for giving suggestions on the use of PCA and CCA and two anonymous reviewers for their helpful comments on the manuscript. Author also acknowledged that this work was supported by Research Fund of the Istanbul University (Project Number T-754/13092005). Albay, M., Akçaalan, R., Aykulu, G., Tüfekçi, H., Beattie, A.K., Codd, G.A., (2003). Occurrence of toxic cyanobacteria before and after copper sulphate treatment in a water reservoir, Istanbul, Turkey, Algological Studies, 109: 67-78. Apha, Awwa, Wpcf, (1985). Standard methods for the examination of water and wastewater, 16th Edition, Greenberg A. E., Trussel, R. R., Clesceri, L. S., Franson M. A. H., Washington. Berzins, B., Bertilson, J., (1989). On limnic micro– crustacean and trophi degree, Hidrobiologia, 185: 95-100. Butturini, A., Bernal, S., Sabater, S., Sabater, F., (2002). The influence of riparian-hyporheic zone on the hydrological responses in an intermittent stream, Hydrology and Earth System Sciences, 6: 515-525. Ceylan, M., (1999). Ömerli Barajindaki Ötrofikasyon ve Bagli Derelerin Baraj Gölü ve Üzerine Etkisi. Yüksek Lisans Tezi, Gebze Yüksek Teknoloji Enstitüsü, Mühendislik ve Fen Bilimleri Enstitüsü. Istanbul. Cobelas, M.A., Rojo, C., Angeler, D.G., (2005). Mediterranean limnology: current status, gaps and the future, Journal of Limnology, 64: 13-29. Dere, S., Karacaoglu, D., Dalkiran, N. (2002). A study on epiphytic algae of the Nilüfer stream (Bursa). Turkish Journal of Botany. 26: 219-233. Goldman, C.R., (1988). Primary productivity, nutrients, and transparency during the early onset of eutrophication in ultra-oligotrophic Lake Tahoe, California-Nevada, Limnology and Oceanography, 33:1321-1333. Gürevin, C., (2004). Ömerli (Istanbul) Baraj Gölü Su Kalitesi Problemlerinin Arastirilmasi ve Sürdürülebilir Kullanimi. Yüksek Lisans Tezi. Danisman Albay, M. Istanbul Üniversitesi Fen Bilimleri Enstitüsü. Istanbul. Gürevin, C., Tüfekçi, V., Tüfekçi, H., Albay, M, (2006). Determination of water quality parameters of Ömerli Reservoir and effects on diatom growth, Verhandlungen Internationale Vereinigung für theoretische und angewandte Limnologie, 29: 2253-2255. Jordan, T.E., Correll, D.L., Weller, D.E., (1997). Effects of agriculture on discharges of nutrients from coastal plain watersheds of hesapeake Bay, Journal of Environmental Quality, 26: 836-848. Legendre, P., Legendre, P., (1998). Numerical ecology. 2nd English ed. Elsevier Science BV, Amsterdam, Netherlands. Mozdukhay, F. D., (1969). Identification Key for Fauna of the Black and Azov Seas. Tomvtonoy uz Frelliving Invertabrates Arthropoda. Naukova Dunka publ., KIEV. Osborne, L.L,, Wiley, M.J., (1988). Emperical relationships between land use/cover and stream water quality in an agricultural watershed, Journal of Environmental Management, 26: 9-27. Pontin, M.R., (1978). A Key to the Freshwater Planktonic and Semi-Planktonic Rotifera of the British Isles. Freshwater Biological Association Scientific Publication No: 38. Rose, M., Tregouboff, G., (1957). Manuel de Plantonologie. Mediterraneenne Centre Natonal de la Recherche Scientifique. Paris. Ryther, J.H. and Yentsch, C.S., (1957). The estimation of phytoplankton production in the ocean from chlorophyll and light data, Limnology and Oceanography, 2: 228-286. Shannon, C. E., Weaver, W., (1949). The Mathematical Theory of Communication. The University of Illinois Press, Urbana, IL. ter Braak, C.J.F., (1994). Canonical community ordination. Part I. Basic theory and linear methods, Ecoscience, 1: 127-140.
ter Braak, C. J. F., Smilauer, P., (2002). Reference manual and user’s guide to CANOCO for Windows. Software for canonical community ordination, version 4.5. Centre for Biometry, Wageningen, The Netherlands. Yan, N.D., (1986). Empirical prediction of crustacean zooplankton biomass in nutrient poor Canadian Shield lakes, Canadian Journal of Fisheries and Aquatic Sciences, 43: 788-796. Zar, J.H., (1999). Biostatistical Analysis, 4th Edition. Prentice-Hall, Englewood Cliffs, NJ, 663 pp.